Even though the official run isn’t until March 4, the entire weekend is packed with activities that help to raise funds for the tuition-free Seaside School, which educates local 30A children as well as those in surrounding Walton County. Taste of the Race gets you energized—figuratively and literally—for the big run. Taste of the Race is a big food-tasting event where local chefs and restaurants feature some of their best bites. It’s a big party under a big, heated covered tent. Live music an open bar put everyone in a great mood. Among the restaurants that participate (like iconic Bud & Alley’s, Stinky’s Fish Camp, and Great Southern Café) is Emeril’s Coastal Italian restaurant, and Chef Emeril Lagasse makes his appearance as well. If you’re a real foodie, then spring for the VIP Taste of the Race tickets. As a VIP, the party starts at 6 p.m., an hour earlier than the general admission Taste of the Race event. You enjoy specially-prepared hors d’oeuvres and cocktails while experiencing an exclusive cooking demonstration with Chef Emeril. In the past, VIP guests have also been able to take photos with the celebrity chef in addition to receiving a special gift. On Saturday, March 3 is the Race Day Expo held at the Seaside Lyceum. This is where you pick up your race day packet and check out the race sponsors and participate in the silent auction. The expo is from 12 p.m. to 6 p.m., and it’s a must-do. For one, policy is that each racer picks up his or her own packet with a photo ID (this is a big deal). Second, if you want to race and haven’t registered, then this is your last chance to buy tickets. It is not possible to register and run on Sunday, March 4. Expo day is usually sunny and beautiful. There’s live music from 12 p.m. to 2 p.m., and everyone’s in a great mood. The silent auction will feature “buy it now” pricing, and lots of the sponsoring agencies have cool freebies along with info about their organization. 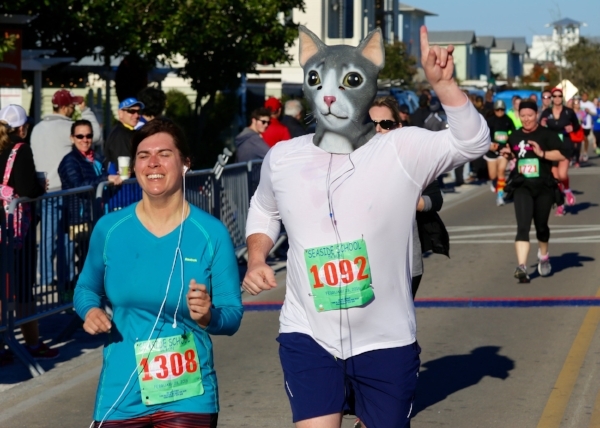 Let the fact that the expo ends at 6 p.m. be a cue that you need to go home and get some sleep; the Seaside School Half Marathon & 5K Run presented by Vera Bradley starts at the Seaside Amphitheater at 7 a.m. The 5K starts at 7:25 (but you should still be there before the half marathon starts). The post-race party kicks off at 8:30 a.m. and lasts until 11:00 am. During the party there will be more silent auction fun, live music, and awards. All race finishers gat a Vera Bradley tote, the moisture wicking race-tee, and half marathon runners get a custom finisher’s medallion. Tickets for the race are available until the end of the expo on March 3 or until they run out, so click here and buy now. Tickets for the Seaside School Half Marathon & 5K Run are available until the end of the expo on March 3 or until they run out, so click here and buy now. All proceeds go to benefit the Seaside Neighborhood School. Click here to learn more. This is a great event and one that The Storyteller Agency is happy to sponsor and to support year after year. One more month until the party begins!